The Brady Center to Prevent Gun Violence today launched a multi-platform public awareness campaign for a future where no child is killed by a parent's gun. More than 2,700 children die from guns annually. Studies show that most youth gun deaths involve a gun from or in a home, including school shootings, unintentional shootings, or suicides. 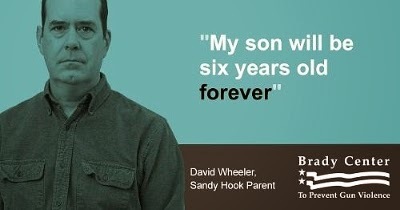 The new campaign includes a report, "The Truth About Kids & Guns," a public service announcement airing on television stations nationwide; and a provocative national digital advertising campaign featuring David Wheeler, whose son Ben was killed in the shooting at Sandy Hook Elementary School, and Ann Marie Crowell, whose son Brian died in an unintentional shooting at a friend's house. In both tragedies, the guns were brought into the home by a parent. The campaign is timed to America's Safe Schools Week (Oct. 19-25) and is especially relevant given the recent shootings and gun incidents at schools in Kentucky and North Carolina. School violence and gun-related injuries ranked within the top 10 parental concerns nationally, according to a recent poll. Studies have shown that 68% of school shootings involve a gun from a home. "Parents need to know that most youth gun deaths and injuries are preventable, including the tragic school shootings that horrify our nation," said Dan Gross, president of the Brady Center to Prevent Gun Violence. "Most parents bring a gun into the home with no intent of harm or wrongdoing. Yet it is these guns that cause the majority of gun deaths and injuries at home or in schools. As parents we need to be fully aware of the risks of kids and guns in the home and what we can do to keep our families safe." The campaign's digital advertisements and a public service announcement have been designed to help parents understand the risks of having a gun in the home and offer a simple step every parent can take to keep their children safe from guns: ask if there's an unlocked gun where your child plays. The advertisements can be viewed at www.bradycenter.org/future. In one thought-provoking digital advertisement, David Wheeler says: "My son will be six years old. Forever. Unsecured guns kill hundreds of kids each year. Help us achieve a future where no child is killed by a parent's gun." In another powerful digital advertisement, Ann Marie Crowell says: "My son's last words to his friend were: 'I can't believe you shot me.'" 2,703 children and teenagers died from firearms in 2011. Children are more likely to be killed by a gun in the home than anywhere else. An alarming 60% of firearm-related deaths among children and teens (0-19) occurred in and around a home, whether it's in their own home or the home of friends, neighbors and family members. 4 out of 10 firearm youth homicides take place in a home. 8 out of 10 firearm youth suicides occur in a home. 9 out of 10 unintentional youth shooting fatalities take place in a home. Two-thirds (68%) of attackers in school shootings had acquired the gun(s) from their own home or that of a relative. Over one million students reported being injured or threatened with a weapon on school property in the last year. Access to a gun was highest among adolescents who are white, who live with two parents and have a mother with at least a high school degree. The cumulative message of the campaign, Gross said, is that parents can have a direct and immediate impact on children's access to guns and can play a real role in preventing tragedies and saving lives. To help parents ask about guns in a home, Jennie Lintz, director of Public Health and Safety at the Brady Center, suggests parents say, "In the wake of all the terrible violence in the news, I'm worried about guns—I'm sure you are, too. Please don't take it personally, but can I ask you to reassure me that you don't have unlocked guns in the house that might unintentionally hurt our kids?" For more information about the campaign, visit www.bradycampaign.org/future, to watch the PSA, visit www.askingsaveskids.org. The report can be downloaded at www.bradycampaign.org.